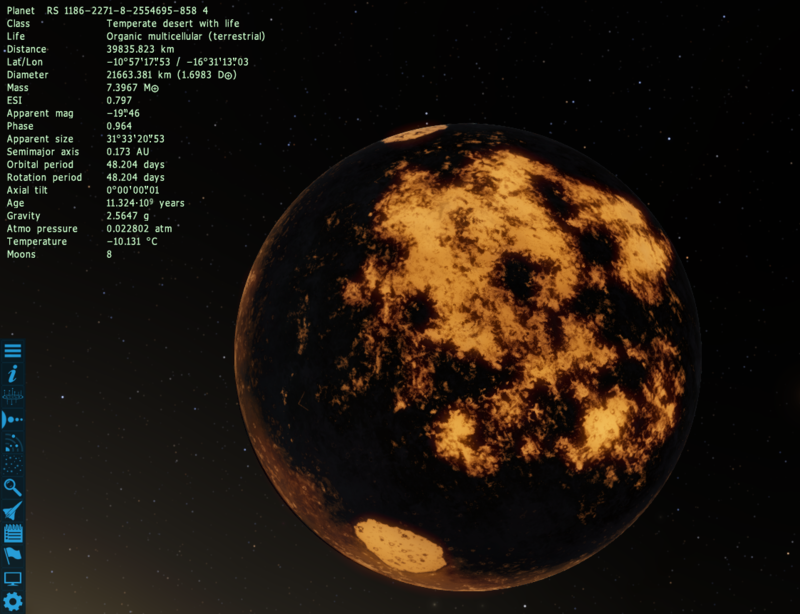 Forum » SpaceEngine » General Discussions » I've made a wiki for fun, please check it out! I've made a wiki for fun, please check it out! So I've decided to make a wiki for Space Engine, but its set in a fictionalized future. The basic idea is that you create an extended backstory based off of a world or worlds in the engine. It doesn't really matter what version you use (I'm still using 9.7.3) as long as you let everyone know where it is in the engine and what version you used. There's already an established canon. It's basically the year 10000, humans have spread across the Milky way and its nearby neighbors but until fifty years ago had never reached Andromeda. With the discovery of how to create artificial wormholes the universe opened up and expeditions were sent out everywhere. You can take a planet or moon with life and make it an alien homeworld, or take a planet with or without life and make it a human colony world. It already has a couple other people making articles for it and their stories so far have been fascinating to read. Please check it out! Nice I am already enjoying by readying it! I have been checking it out, looks nice. This idea is neat, but the timescale makes me raise mental eyebrows. 10,000 years isn't enough to colonize the whole, or even a sizable fraction of, the Milky Way or to reach its satellites unless humans have already broken the light barrier. Wormholes, remember? Instant travel to wherever you want to go. ^ In that case the OP's intro paragraph is misleading. The impression I got was that first the Milky Way was colonized, then 50 years ago wormholes were tamed and people went to the Andromeda galaxy. The converse is that 50 years ago, wormholes were tamed and basically all of the colonization has taken place since then in an explosive surge - equally if not more unrealistic. Or is it the case that interstellar wormholes were developed millenia ago, but better ones were invented in the last 50 years? I'm still working on it, but here is my writeup so far, do I need to change anything? The Life section is currently being worked on. Davpaul/Daquob'aa ( RS 1186-2706-8-4850422-616 4 in 0.9.3 ; replace the ending number with 7 or 9 to go to the others mentioned ) is a Terra-class planet, and orbits an M2-class Red Dwarf at a distance of 0.139 AU away. The star is virtually half the size of Sol's sun, and has a temperature of 3310 degrees centigrade. Davpaul is the 4th planet from the star, is tidally locked, and completes an orbit of its sun roughly every 35.3 days. It's atmosphere is fairly thin, at only 0.66 of Earths atmosphere, and it's gravity is 0.93 of Earth's gravity. It has 2 moons, which are merely captured asteroids, and a large, violent storm on the star-facing side, as do nearly all tidally locked planets. Only less than half of Davpaul is habitable; the side facing away from the star is frozen solid. There are a few small towns that have popped up in the terminator, but only the very hardy can live there. The technology level of the resident Daquob'ans is roughly equivalent to the Sol system in 2100, as they hunt the native multicelluar "Skywhales" (named by the Isvoy captain) that have taken a foothold on the 7th, and 9th planets of the system. Due to the thin atmosphere, all life on the planet has evolved extremely well-developed "nose-like" structures. The Daquob'ans are an example: They are roughly 6 meters tall and skinny, and have a huge "head" containing all of their organs. Their "ears" are very large, and are actually what they breathe with; it is estimated they have twice the lung capacity of a normal human. Native animal life also follow this protocol; they all look different of course. Birds have very large wings so they can soar through the thin atmosphere. Even the strange "Firehawk Fly" is long and thin; it's gangly legs stretch some 6 inches from a bulbous head with eyes and wings. Some animals do not conform to this however. Translated from the local language as "Ball-Movers", these basketball-sized shiny animals get from place to place by rolling. They seem to be herbivores, tearing vegetation from the ground with their well-hidden mouths as they roll over it. Plant life is very different than what Humans are used to. These plants are large, thick, and fibrous, as to protect themselves from solar flares. They are also not green, but blact, to absorb as much light as they can from the dim star. The sentient life on this world calls themselves "Daquob'ans" in their own language, a tonal language which sounds like a musical string of moans and grunts, interspersed with clicking noises. They have won out as the most dominant race of Davpaul. Their population is around 400 million individuals. They are an ancient race, having come to prominance around the Late Bronze Age on Earth. Every Daquob'an is raised to believe that the large hurricane-like storm caused by the tidally-locked world is their god, and they must return to him in 516 Davpaul years from the time of birth. This happens every year on a Daquob'an holiday called "Returning Day", in which hundreds of thousands of Daquob'ans literally drown themselves in the eye of the great storm. The journey there is extremely treacherous, with extremely windy conditions, extremely high waves, and frayed nerves on the sacrificial ships. However, all this hardship is considered worth it though, as within the eye of the storm is said to be an island paradise where they can spend their final days before Returning Day. The day itself is considered a celebration, lead by the "Windstorm Magus" who is the only one allowed to live on the island. Since they are an early space-faring race - they are learning to work together, and they do not have much usable land mass to begin with, few countries exist on Davpaul. The two main continents have only 13 political divisions between them. There is an isolated island group on the opposite side of the planet that is ruled by 1 country. We use "country" as an easy reference point here, but in the Daquob'an language, they are called "Dob'ii", and plural, "Dob'ia". They all use the same form of government, which to humans would seem like an "extremely benevolent dictatorship with human rights". The world is increasingly getting converted to one government, as the "Prem Ultima" of each "Dob'ii" discover that there is more out there in their local space. The Largest of these has been translated as "The Benevolenvy of the Kath'ee", after a collection of islands on the border. The Daquob'an species is a very early Type 1 society, despite it being thousands of years old. That is because of their religious faith. According to Daquob'an religious texts, the "Godstorm" has decreed that their planet is the only one in the entire universe, and as such there is no point to look for others. Some have turned their ear on religion and have moved forward to create technological advancements despite this, resulting in the first "Subwarp Drive" a couple Earth decades ago. Compared to Earth technology, this is very rudimentary, and the top speed is estimated to be around 0.5 AU an hour, as measured by the Isvoy's sensors. However, it is more than sufficient for their solar system, which is only 32.64 AU in size, and is sufficient to get them anywhere in the system in 3 Earth days or less. It is still far too slow for visits to even the nearest star system. They use ships equipped with this technology to harvest the "Skywhales" that have arisen on the 7th and 9th planets of the system. They use the term to refer to any huge, floating animal that have arisen on gas giants. "Ziin'ar", the 7th planet, is very cold but has evolved an extremely hardy atmospheric species Their internal structure is mosty made up of gas bags which they use to float in their atmosphere; they are hunted for their hides, and suprisingly their meat, which is said to be a delicacy. The species on "Yahk'nu", the 9th planet are even larger, measuring up to half a kilometer long. These animals congregate in packs, and scientists aboard the Isvoy have concluded these huge animals are in an "Early Type-0" stage of development. They use "Yahk'nu"'s one major moon which has a strikingly similar makeup to the parent planet as a "farm world" for these huge animals. They are extremely expensive however, since they are very hard to prepare, the Daquob'ans apparently do not believe in space stations, and Daquob'an barges take up to 2.5 local years to reach the farm moon. They are then tractored up, prepared, and shipped back to Davpaul, where they are sold to high-class eateries around the planet. Ihe Isvoy has observed daily life of the Daquob'an people for three Earth weeks (cloaked so they are not discovered), have sampled the world's flora and fauna, and have determined that this world is NOT to be disturbed until the Daquob'ans develop their own FTL drive. Data returned from tapping into news feeds has been decoded by the shipboard computer and indicate this will not happen for at least another 220 Earth years, although their scientists seem to know how theirs will function.